sugar high friday is a food blogging event that i often read about but never quite manage to find the time to get involved with. sweets and puddings aren’t that high on my list of things to cook and, perhaps more to the point, people are usually intimidatingly inspired to create the most elaborate concoctions. however, when i saw that david lebovitz was this month’s host and that the theme was chocolate, or more specifically what brand of chocolate you choose to cook with, i knew i needed to make the effort to get involved. green & black’s is my default choice of chocolate, all their products are organic, some are fair trade and they all taste great. green & black’s is an ethical choice that is increasingly easy to make as the products are stocked ever more widely - it’s is the common denominator when it comes to buying chocolate at my local supermarket, the local italian deli or the station/corner shop. so, what to make… on saturday we had our friends michael and bobby round and it was their first night out alone since they had their second baby. as time was tight, a quick-to-eat pudding, that was also suitable for packing up in case they needed to head off unexpectedly, was required. these ginger, almond and orange clusters seemed like the perfect solution. melt the white chocolate in a bowl placed over a saucepan of boiling water (the bottom of the bowl must not touch the water). when it is completely melted stir in the ginger, almonds and orange zest. form the mixture into walnut-sized balls and place on a baking tray lined with greaseproof paper. chill until firm. melt the dark chocolate in the same way as the white. 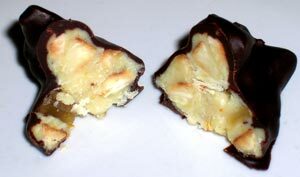 pierce each white chocolate piece with a skewer or small fork, the dip it into the dark chocolate to coat it. place the covered chocolates on greaseproof paper. chill until ready to eat.